Public opinion surveys conducted since the bombings last week at the Boston Marathon indicate that most Americans — while convinced future attacks are quite likely — don’t feel personally threatened by terrorism, and an increasing share of the public is skeptical about sacrificing personal freedoms for security. Concern about another terrorist episode in the United States has increased after the events in Boston, which led to the deaths of four people and wounded more than 260. But there has not been the upsurge in concern over such an attack that there was in the aftermath of Sept. 11, 2001, in New York City. The post-Boston polls have also shown that Americans’ personal sense of threat — as opposed to the generalized threat that the country faces — remains low. In the most recent Washington Post survey, roughly 7 in 10 respondents were worried either a great deal or somewhat. That figure increased just slightly from the last time the newspaper asked this question, in September 2008. A Pew Research survey released Tuesday reinforced those results. It found that while 75 percent of Americans expect acts of terrorism to be a part of life in the future (up by 11 percent from a year ago), worry about terrorism has not increased. 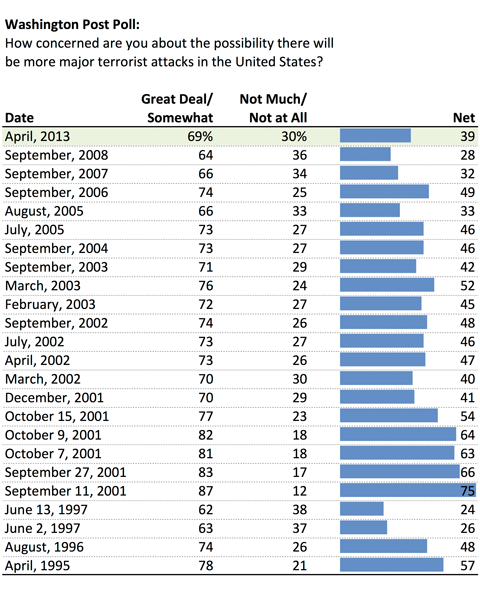 The Boston bombings have also not added to Americans’ personal sense of threat, according to the recent polls. The Washington Post poll found that only 40 percent of respondents were concerned about an attack in their community, while a Fox News poll released last Wednesday showed 34 percent of respondents were worried about a terrorist attack where they live or work. That’s unchanged since Fox last asked that question, in May 2006. 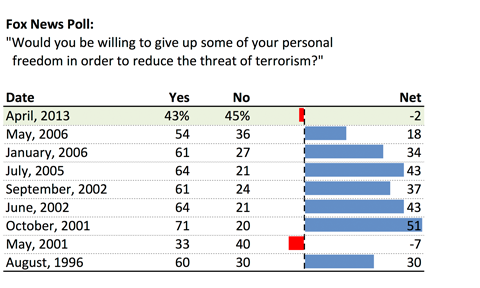 In addition, the post-Boston polling did not find an increased willingness to give up personal freedoms in the fight against terrorism. That contrasts with the period after the Sept. 11 attacks, when Americans told pollsters they were much more willing to trade some civil liberties for safety. A Fox News poll in October 2001 found that nearly 3 in 4 respondents would give up some personal freedom. 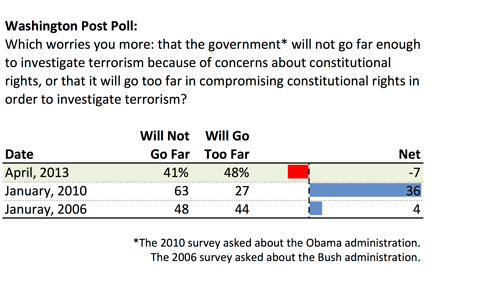 A majority of respondents in 2006 still said they would give up freedoms. But the most recent Fox News survey found that — for the first time since before 9/11 — more respondents were unwilling (45 percent) than willing (43 percent) to sacrifice personal freedoms to reduce the threat of terrorism. The same pattern is evident in the Washington Post’s poll. Americans’ continued focus on civil liberties in the wake of the events in Boston may be a sign of a growing resolve to live with the threat of terrorism. The recent Fox survey found that only 18 percent of the 619 registered voters interviewed nationwide said the Boston bombings would change the way they led their everyday life (5 percent said it would change “a lot,” and 13 percent said “a little”). The recent Washington Post poll asked “have you or has anyone in your household started avoiding crowded places such as shopping malls because of the chance of terrorism, or not?” More than 90 percent of respondents said no. Finally, a Rasmussen Reports poll of 1,000 likely voters conducted after the events in Boston found that more than half of the respondents — 54 percent — said economic threats were a greater danger to the country than terrorism. That is almost unchanged from a Rasmussen survey conducted in late January, more than two months before the bombs were detonated in Boston near the marathon finish line.